Eureka Ergonomic is a brand with more than 150 passionate engineers working hard to solve your everyday ergonomic problems. Based on our customers concerns and everyday ergonomic issues, our engineers developed the Eureka Ergonomic® Sit Stand Desk, it is stylish and have large space. Simply squeeze the handles, it will automatically raise up for some distance without any strength needed, which you could see how effortless it is. And when you need to keep raising up, use little strength to reach your desired height. You will fall in love with the smooth and effortless operation that the others could not offer. It is the key feature that make us stand out from our competitor, and also make you stand out in your office. We uses patented gas strut mechanism which greatly differs from the springs lifting mechanism in the market. It will offer you the most silent experience. Almost Zero-noise. You could feel how silent it is when you got the chance to compare to other sit stand desk. Top tier desktop can hold up to two monitors. Bottom tier has plenty of space for your laptop or keyboard. Plus, a special groove has been added for your tablet or smartphone! Our Desktop Converter's Weight Capacity and large desktop make it the only choice when upgrading your office space. The 35 lb. weight capacity makes it ideal for mounting up to two 30" monitors when using dual monitor arms and two 24" monitors when not using arms. 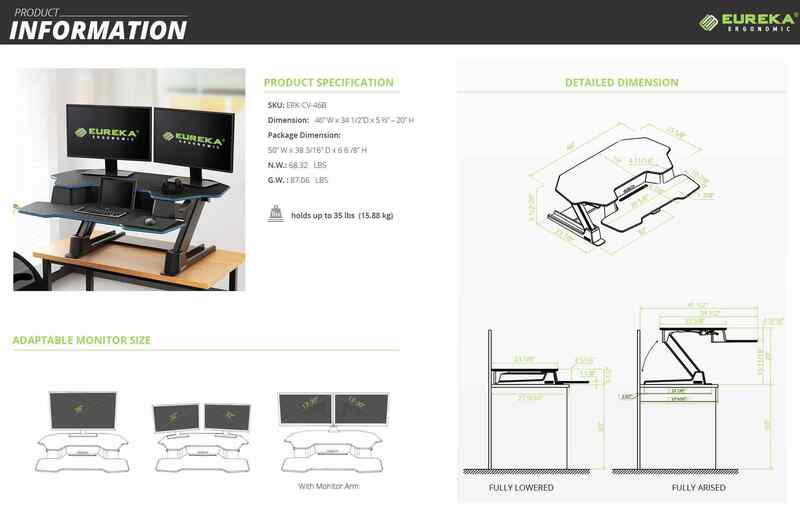 Compared with other brands brands, the Eureka Ergonomic Standing Desk Converter is smooth and can raise higher with unlimited positions. Mobile Device Slot To Support your Phone or Tablet. Added Ledge To Secure Your Keyboard. Covered Components For A Safe Sleek Design. Monitor Arm Cut-out Compatible With Most Mounting Hardware. No tool needed, use right out of the box. Free shipping with lower 48 states. 30 day risk free return guarantee, we will help quickly arrange the return within 24 hours and you do not need to pay for the return shipping fee. Just have a no risk try if you could not make your final decision. 3-year warranty, start from the day you place your order. Best Service Team Support: Our service team will keep online for 24 hours, and will help you solve your question as soon as possible.